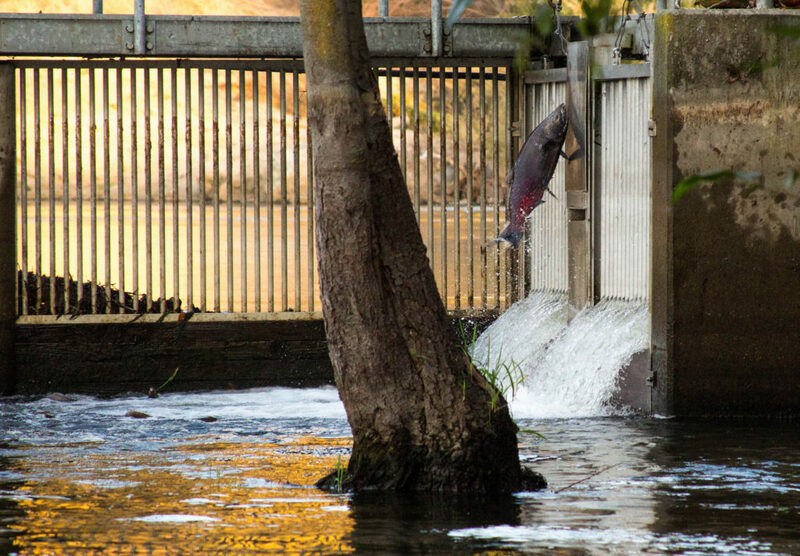 A chinook salmon, having returned up the Mokelumne River to spawn, leaps against the closed gates of the fish hatchery at East Bay Municipal Utility Districts’s Camanche Dam. “Civilization creates for me a thousand other worlds that have little to do with my senses, a thousand illusions among which to choose. It is one of the functions of much of contemporary education and politics to convince me that my choices are limited to these creations. Were there a television in my home, it would spend twenty-four hours a day convincing me that life is either a series of dangers and disasters or an endless series of shallow and banal encounters with uninteresting people. Magazines and newspapers tell me the same story. Shopping malls connected by broad paved highways are filled with objects presented as the rewards of existence–the flesh of the world converted to doodads. Big Science has had a good deal to do with the creation of this deadly alternative reality, and science has willingly lent its hand to the great effort to to convince me that the evidence of my senses and the intuitions that arise from their use are illusory. Thanks to a couple of people I met through some of my salmon reporting on KQED, I got to go out fishing today on a boat that put out from Moss Landing, on Monterey Bay about 100 miles south of Berkeley. I’ve considered it a little odd that I’ve developed a passionate interest in California salmon without once having fished for one. But on balance, only a little odd. Today, I only kind of fished. I went out with Marc Gorelnik, a board member of the Coastside Fishing Club, whose boat is currently berthed at Moss Landing. His crew were a couple of guys named Chris from Marin County. All three knew their way around the boat and all the gear. They rigged the gear and set the lines while I mostly spectated (though I guess I worked in my own fashion: I had my recorder and camera with me, so I came back with sound and pictures). Since I was a salmon rookie, the first time a fish hit one of the lines, the rod was handed to me and I reeled in whatever was on the end of the line. It turned out to be a salmon, though not a huge one. The minimum size anglers are allowed to keep this year is 24 inches; under that length, and you have to release them. The fish on I was pulling in was borderline. One of the Chrises landed the fish and then measured it against a guide on the stern. Twenty-two inches. Using a device that looked a little like a screwdriver with a blunt end–the idea is to minimize handling of fish that will be released, because the whole point is that they’ll survive to grow into mature adults–Marc “shook” the fish off the line, and back into the water it went. (The term for undersize fish, which I never heard before last week: “shakers”). Two other fish would up on our lines, though–both shakers. The last one hit one of the rigs on our way in, immediately after one of the Chrises said, “One fish. One fish can easily be divided four ways. The fish in question is pictured (click on the images for larger versions). It was a little thing, maybe a foot long. It would have been hatched out the fall before last (2009), and then either made its way to the ocean (if it was naturally spawned) or was released on the upper reaches of San Francisco Bay (the recent practice for most hatchery-generated fish) about a year ago. Given its size, it’s got nearly a year and a half more to survive at the mininum before it will begin its run back to fresh water somewhere in the Sacramento River system. So there it is–a shaker. I caught only a brief, brief glimpse of it. It was small, but it was a beauty. Like everyone else, I’m given to enthusiasms. Like everyone else, my enthusiams are too many to list. Thinking about them, most seem to involve a narrative of some kind: the progress of favorite remembered plays in baseball or basketball–any sport, really–to movies and books to roads I’ve traveled and places I’ve visited and on good days to whatever I happen to encounter in the world. One of my enthusiasms, strange to tell for one who has hardly ever hooked a fish, is for salmon. Specifically, the salmon of the Pacific coast. And going with the notion of story, I think the biggest part of my attraction is to the salmon’s life narrative: birth in cold inland waters, migration to the sea, a sojourn that can last several years in the hostile wilds of the ocean, and then a long homeward journey to find that birthplace stream, whatever the obstacles, spawn just once, and die. It’s a great story, and my often half-informed fervor to share salmon history and lore for anyone who will sit still for a minute has led my colleagues at our Local Major Public Radio Station (LMPRS) to adopt a “safe word” when they think things are getting out of control. It’s “coho.” At the same time, I’ve probably gotten as much interest (or forebearance) as anyone could reasonably expect when suggesting salmon stories to develop for broadcast. Earlier this month, I got to attend a West Coast fisheries conference and do a few stories on prospects for the coming salmon season. But that interest from my fellow journalists always comes with a question that I’ll summarize this way: “Salmon? Why should we care about salmon?” It’s a reasonable enough question: Every news story in every news venue contains some sort of explicit or implicit rationale or assumption about audience interest. Falling housing prices? Well, a lot of the audience is in that boat. E. coli in the food supply? We all eat that food. Rising taxes or reduced pensions? You see how it works. In narrating the plight of California’s once-great native salmon populations, those who seek to save some semblance of the historic fisheries are learning to play that “why should anyone care?” game. In the past couple of years, they’ve brought consultants into play who can quantify what salmon mean economically. Cancelling two straight commercial salmon seasons, they reported, cost boat operators and fishing communities upward of $2 billion and 23,000 jobs. I suppose the numbers are powerful, and it’s useful to have them when trying to persuade someone else that the decline of salmon is a story that matters. But the power of the statistics only goes so far: Someone else whose ox is being gored in the debate–for instance, the Central Valley farm interests who might not get all the water they want because some is being set aside for salmon–can come up with bigger, scarier numbers. And the numbers are unfortunate in another way: The pure economic impact is important, of course; whole societies have lived their lives around the salmon. But the cost a lost salmon season doesn’t begin to touch on the wonder of the animal and its place in the world or on what’s really lost when wild salmon runs go dead. As it happens, my schoolteacher wife is teaching her fifth-graders about watersheds this year. Part of the lesson is about fish, and she’s been particularly interested in learning about efforts to restore one of Northern California’s last surviving wild coho runs, up in Marin County. One book in her watershed library is the one pictured above, “Salmon Stream.” The entire contents: a simple narration of the salmon’s life history. What’s wonderful about it is it presents the fish–the “resource”–as something of value for its own sake, without economic justification or cost-benefit analyses. For me, the answer to why anyone ought to care about the salmon isn’t instantly accessible. The rational piece of the answer is what they represent about the world as it has been, as it is, as it might be, and the toll we’ve exacted from our surroundings to have our lives just so. The non-rational piece is the beauty of the thing itself, from conception to death. And maybe, when the question comes up next, I need to have copies of that picture book handy. Day 1: I left home for the Oakland airport at 7:20 a.m. or so. My plane departed at 9 a.m. and landed in Portland at 10:40 or so. I was behind the wheel of a rented car by 11 a.m. and at the Hilton in downtown Vancouver by 11:30. In a hallway, I recognized a voice I'd only heard on the phone before–Barbara Emley, a San Francisco salmon troller who's been fishing salmon since the 1980s. I introduced myself and she invited me to lunch with her and two fishermen, Dave Bitts of Eureka and Joel Kawahara, from Washington's Olympic Peninsula. They filled me in on the morning's proceedings and what was to come in the afternoon, including a discussion of limitations that may be posed on this year's chinook salmon catch to accommodate threatened populations of killer whales, which like to snack on them. I spent the afternoon in a variety of meetings and talking to a variety of people, including Chuck Tracy, the PFMC officer who works on salmon issues. At about 5:45, I headed over to my friend Pete's house in Portland to hang out with him and his boy Niko. Day 2: Sunday morning I was at the hotel by 10:30 or so for another day of meetings both on the status of the Sacramento River salmon fishery and on initial suggestions for the 2011 fishing season. I interviewed about half a dozen people, pulled a couple soundbites, wrote up a short story to air on KQED's local news on Monday morning, did a read-through with my editor in the Bay Area. I got out of the hotel about 7:45, went to Pete and Niko's, had a late dinner, then voiced and uploaded my story. Pete and I stayed up talking until about midnight, then he went to bed. Since I had promised a second story, I stayed up and wrote that, pulled another soundbite, and sent it off to one of the editors in San Francisco. Day 3: Monday, which at one point in this adventure was penciled in as a day off, I was up at 7:30, drank Pete's excellent coffeed, stayed at the house while Pete took Niko to school, then voiced the second piece I had written the night before, wrote a third piece (these are all very short, like a minute, max), voiced that, then uploaded everything to KQED. I made an attempt to talk the editor of our statewide show to put off a Tuesday morning story I had promised her, because I was hoping to have a pressure-free day before flying back to Oakland in the evening. But my gambit didn't work, and a promise is a promise, so I said I'd have a script to her late in the afternoon. In the meantime, Pete had returned home and we had talked about going to Powell's, the landmark bookstore in Portland, which I had never visited. So we walked to the Lloyd Center "Max" station–about three and a half miles from Pete's, as it turned out–and rode free to the heart of downtown, then walked the rest of the way to Powell's. We hung out there and both bought something–I got a cookbook, which I never do, and a novel by Peter Carey that's supposed to be something of a gloss on Tocqueville's visit to America. Then I bought Pete lunch at Little Big Burger, which was awesome (we each consumed 1.5 cheeseburgers and split an order of fries). Then Pete said, "Well, you feel like walking back?" I did. So we set off across the Pearl District, Old Town/Chinatown, the Burnside Bridge, and up Burnside Avenue to Laurelhurst; we detoured through Laurelhurst Park, with Pete filling me in on details of the neighborhoods we passed through. At 3 o'clock, when we got back to Pete's, in the general vicinity of Mount Tabor, we had walked another four and a half miles or so. The total for the outing came to about nine miles. Back at Pete's I packed up, loaded up the car, took my leave, filled up with gas, and made the short, easy drive to the Portland airport for my 6 p.m. flight. There, I schlepped my stuff to one of the cool little work carrels they have in the terminal buildings and, at about 4:20, began writing my story for Tuesday morning. At about 5:30, I had something that was, if not profoundly insightful, most likely would not provoke shrieks of outrage from editor or listeners. I did a quick read-through with said editor, then packed up my stuff and walked to the gate for my flight, which was due to be boarding. It was a little late, but not by much, and the flight was uneventful. We got to Oakland about 7:30 or so. Kate picked me up. We went home, had dinner, walked the dog, and then I recorded my voice tracks and isolated my soundbites and uploaded all the sound. Lest that all sound real quick, I was done with all that at 12:30 this morning. Day 4: This morning, while I was asleep, an engineer mixed the sound, and the piece aired at 5:50 a.m. I caught it during a 6:50 repeat and at some point realized I had made a factual error in the piece. So I wrote a correction for that, too. Later, I vacuumed the house. I read a press release from the state Department of Fish and Game last week that the hatchery up in Oroville, on the Feather River just below the big State Water Project dam, was about to open its gates to fall run chinook salmon and steelhead. Saturday we drove up there, 142 miles from Berkeley, to see what the show looked like. After several years of disappearing fall salmon runs, it was a thrill to see the fish coming up the ladder toward the hatchery. In the river at the bottom of the fishway–a low dam blocks the fish from going any further upstream–it seemed there were hundreds of salmon, maybe more, churning the water and leaping into the air. The ladder includes a below-grade viewing area so you can see the fish on their way up. We were there for two or three hours, and we saw a steady stream of people, including lots of families with kids, coming to check on the run. Very cool. Someone at the Environmental Defense Fund sent this to me at KQED after chatting me up about the Salmon Summit in San Francisco tomorrow (what’s the Salmon Summit? See below). I don’t know whether it’s on the level–is all that fish really going to be served? If so–cool! But obviously the real point is about water and fisheries in California. And as far as the summit goes: It’s a meeting organized by fishing and environmental groups to highlight the impact of both the drought and California’s water policy on salmon and other fish, and to counter the message from agriculture and water interests that 1) California is in the midst of a “regulatory” drought and 2) that California agriculture is being sacrificed to the interests of a minnow (the delta smelt). The fishing/environmental folks (some style themselves “the salmon community”) really began this campaign last month. That’s when one of our senators, Dianne Feinstein, began pushing for a bill to guarantee water deliveries to the drought-stricken western side of the San Joaquin Valley. Her legislation would have set aside restrictions on water shipments from Northern to Southern California imposed to protect salmon and smelt. So far, then, the summit sounds like a recap of what we’ve heard already. The question is what new actions the salmon community might want their legislators to take to help bring their fish back. I’m hoping to hear an answer to that tomorrow. San Joaquin Valley water interests and their allies, including members of Congress, want more water than they’ve gotten the last few years. Their biggest problem is that nature has not cooperated. The previous three winters were drier than normal, and the amount of rain and snow that fell on the state’s watersheds were far below normal. That circumstance happened to coincide with Endangered Species Act litigation that has led, for the time being at least, to limits on the amount of water the state and federal water projects are allowed to pump from the Delta to the San Joaquin Valley and Southern California. Those limits, set by federal wildlife agencies and designed to protect the Delta smelt and runs of chinook salmon, have led the aforementioned water interests to scream that the Delta pumps have been shut down, that farmers are being wiped out and valley communities sacrificed for a few lousy fish. Now, whatever you happen to think of the last part of that formulation–that those who are trying to figure out how to save the fish want to see the San Joaquin Valley “dry up and blow away” (as Rep. Jim Costa, a valley Democrat, put it)–you shouldn’t have to think much about the first part, that the pumps have been shut down. That’s because it’s not true. The pumps are running, day in and day out. The major destination for a lot of that water is the San Luis Reservoir, a key storehouse for valley water, and it’s filling up. But despite all the readily available data on Delta water shipments, the untruth that the pumps have been switched off is too good a propaganda point for some people to pass up. Rep. Devin Nunes, who represents much of Fresno and Tulare counties in Congress, says about water resources policy: “Its [sic] Simple: Turn on the Pumps.” Since last session, he’s been pushing a bill called the “Turn on the Pumps Act.” (The bill is, in fact, very simple: “In connection with the operations of the Central Valley Project, neither the Bureau of Reclamation nor any agency of the State of California operating a water project in coordination of the Central Valley Project shall restrict operation of their projects pursuant to any biological opinion issued under the Endangered Species Act of 1973, if such restrictions would result in levels of export less than the historical maximum levels of export” (italics mine). Got that? No limits on pumping to protect endangered species, period, unless the limit results in as much or more water being pumped out of the Delta than the projects have ever pumped. Rep. Tom McClintock, a Southern California Republican who relocated to and won the northeastern California congressional seat in 2008, is also a source of unrelenting “turn on the pumps” rhetoric. Earlier this month, he issued a broadside against Democrats in the House Water and Power Subcommittee for blocking consideration of Rep. Nunes’s excellent bill. “For the sake of humanity, Madam Chairwoman and my Democratic colleagues, turn on these pumps.” You have to admire the way these folks keep their rhetoric on a short leash. What is the connection between those two stories. My good pal Coach Bobby Knight says the common thread is water, liquid, then frozen. Continued wet weather means most of the state’s reservoirs are filling up. But if your definition of drought means all reservoirs brim-full, no, we’re not out of the woods yet. (My KQED Radio News colleague Amy Standen just finished a story that will air Monday: “Is the Drought Over?” (I have a starring role in her accompanying blog post.) Another take on our drought status comes from the U.S. Drought Monitor. Over the last couple of weeks, this report has shown a dramatic contraction of the area of the state affected by drought. The face of the drought: At the end of January, the state Department of Water Resources issued its latest drought update (18-page PDF). The most interesting aspect of the document is the way it adopts the Westlands Water District as a proxy for the drought’s impact on agriculture throughout the state. It’s not a subtle touch, either: the front and back covers of the drought report contain dramatic photographs, courtesy of Westlands, of dead orchards. We’re to understand from the context that drought has killed these productive groves. Inside the report, there’s a writeup on Westlands, complete with a table on page 12 showing the reduction in planted acreage since 2006–a little misleading to use as an index year since it was a decidedly wet year when no one had to worry about water supplies. The table does show that virtually all field, seed, and truck crops have experienced dramatic reductions since ’06 (exception: wheat, for which acreage grew by 53.4 percent, and garbanzo beans, which had a 42.5 percent increase in acreage). At the same time, though, the Westlands table shows that the acreage in tree and vine crops–remember the dead orchards?–has increased by 20 percent since the drought began. Most of that jump has been in almonds, which grew from 55,000 acres in 2006 to 70,000 acres in 2008 before falling back to 67,000 acres last year. Now, there is no question at all that the district, which includes about 1,000 square miles along the western fringe of the mid-San Joaquin Valley, has been hit hard by the shortage of water. It’s dry country and because the district was formed relatively recently (in the 1950s), it’s near the bottom of the totem pole for getting a share of the water pumped into the valley from up north. Yes, land has been fallowed and fieldworkers have lost jobs–pretty much the same way that’s happened during every dry cycle. The question is whether Westlands really represents the face of the drought across the state. Reading about the plight of the district, one would hardly guess that the state’s harvest of processing tomatoes–by acreage the biggest vegetable crop in California–hit an all-time high in 2009 (data by way of the U.S.D.A.’s National Agricultural Statistics Service, in its latest “California Vegetable Review“). Of course, the processing-tomato harvest doesn’t tell you much, either–by itself. And neither does Westlands, if your interest is understanding the wide impact of California’s water challenges. Of course, if your interest is putting the grimmest possible face on the drought to scare up support for a new round of dam- and canal-building–which is exactly what many environmentalists say the Department of Water Resources is doing–then Westlands will do just fine as a poster child. Delta pumps–turn up the volume: The biggest water news of the week came out of the Fresno courtroom of U.S. District Court Judge Oliver W. Wanger (W. is for Winston, not Wendell; and those who know say his last name rhymes with “ranger”) in a case featuring Central Valley chinook salmon, federal fishery and water managers, and (again) the Westlands Water District. On Friday, Wanger issued a temporary restraining order that blocks a federal plan to protect endangered chinook salmon that migrate back and forth through the Sacramento-San Joaquin Delta. The plan limits, but does not halt, exports from the Delta to avoid sucking fish into the pumps that send water south. Westlands and other water districts argued that pumping limits are letting hundreds of thousands of acre feet of water escape into the ocean instead of being shipped to San Luis Reservoir, the main storehouse for San Joaquin Valley irrigation supplies. Letting the water flow out to sea would amount to irreparable harm to communities depending on it for growing crops and providing jobs.